How many unread messages do you have in your inbox? 300? 900? More?! I have lost count of how many mailing lists I am on. I would probably have to guess around the 300 mark… And even that is after a good old Gmail clean up! Tonnes of emails are sent out every day and tonnes of emails are not opened. Why? People nowadays are inundated with endless amounts of information, however, people do not have endless amounts of time to soak all this information up. So, the chances of your email not being opened are relatively high – This is where first impressions count the most. This is most probably your only chance to get the person to open your email. 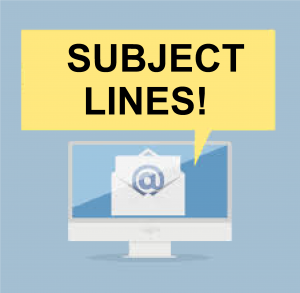 It is arguable that at this point your subject line is more important than your email body. After all, a fantastic newsletter that some had slaved over for hours is completely worthless is it never sees the light of day! For this, you need to be short, sharp and to the point. This is handy when you already have a connection with the customer and is best for notification emails. For example ‘Your order has been confirmed‘ or ‘Track your order now‘. People are most likely to open emails that sound exciting. For example using phrases such as ‘simple tips’ and ‘cutting edge’ are stimulating and putting these phrases into subject lines such as ‘5 simple tricks to create the most relaxing bedroom’ and ‘5 cutting-edge secrets to get that job’ are interesting and exciting. This is another way to increase you open rates. Try personalising through location-specific offers and language or even targeting interests. Many companies use past purchases from their website to tailor the emails.